toilets,” he says frankly. Sam, who happens to be the business advisor for U.S. aid in Armenia and one of many friends I made during a week in this tiny country, has a point. Over six days, I’d driven hundreds of kilometres over what seemed like a vast and undulating cattle grid, relieved myself in various holes dug in the ground and stood outside a boutique hotel with no land line at an altitude of 2,000 metres on a freezing evening, with my arm high in the air trying to get cellphone reception. As much as I loved the country, I had to admit there is some room for infrastructure improve- ments. But despite enduring war, genocide, Soviet occupation and natural disaster, Armenia is rapidly developing into a destination worthy of inter- national tourists. Roads, phones and loos aside, it’s well on its way with the creation of a modern hotel industry. let’s call it, developed on the If You Build It (with ï¬ve-star facilities) They Will Come template. One man has, perhaps unintentionally, embraced the concept and taken it to his home country, Armenia. New York-based businessman James Tufenkian is just one of the 4 million Armenians who make up the diaspora of this country of 3 million. A world traveller and a crusader for workers’ rights and cultural preservation, Tufenkian ï¬rst made an impact by reviving the art of carpet weaving and developing a thriving – and ethically sound – industry in Armenia. Next was Tufenkian Heritage Hotels, which now consists of three boutique properties (with two more on the way). He has created 800 to 1,700 Armenian jobs (some of them seasonal) and, essentially, the country’s tourism industry. “Armenia has no tradition of hotels because people always hosted each other,” Sam’s wife, Lilit Hakobyan (formerly a Tufenkian employee but now a business advisor), explains: “In Soviet times, the only demand for hotels was from Iranian truck drivers. Now, in the regions where [Tufenkian’s] hotels are, more and more places are opening up.” The progress is visible. While Internet cafés and brand names line the streets of Yerevan, a distinctly Soviet inï¬‚uence remains here. The ï¬rst thing I noticed was that every other car on the roads is a Russian-built Lada. There is an obvious absence of American fast-food joints, and the “Italian” shoe shop is, in fact, stocked with Armenian knock-offs. And yet there are still pockets of old Armenia to be found. Behind the Mango bou- tique and the JVC store is a 13th-century church, the remains of a much larger church that was partially destroyed by the Soviets. Further down the street is the Communist-built cinema, grand and gorgeous in its own right but on the site of a seventh-century church that was torn down. And,standing as a reminder of this country’s ancient and more recent history,Mount Ararat watches over the city from a distance. The symbolic heart of Armenia, Mount Ararat, fell to the Turks in 1915and now lies 32 kilometres south of the border. Nevertheless, the twin peaksare considered a national treasure and appear on the country’s coat of arms,bank notes and brandy bottles and in every hotel lobby in Armenia.“Ararat looks different every morning when I look out of my window,” says Hayk, my guide for the week and one of the lucky ones with a mountain view from his apartment. “This mountain alone should be enough to bring tourists to Armenia.” Well, that and the hotels – so off we go. 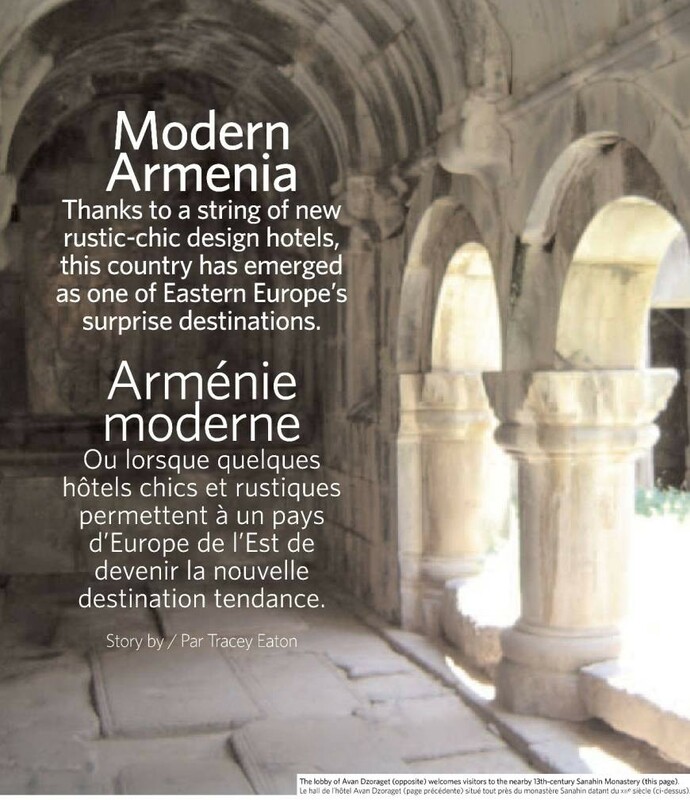 Armenia’s 40,000 historical sites or visiting the burgeoning wine region in the south. 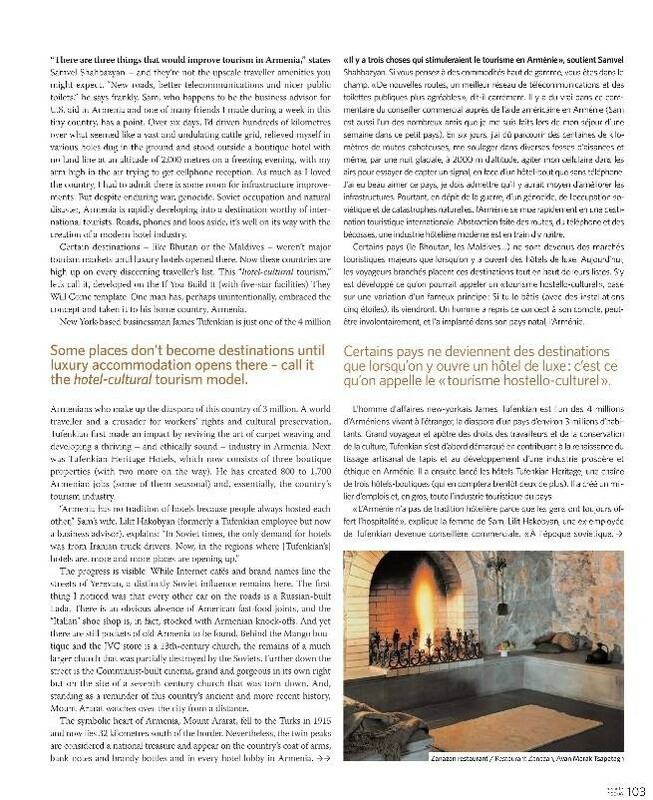 (Tufenkian’s Avan Areni is slated to open in that region, near the hot springs of Jermuk.) But the villa’s location, on the edge of a major city that has started to welcome big international hotels, doesn’t quite do it justice. To really understand the impact of his one-man mission, I need to head north and east to the less developed rural areas that for so long were not easily accessible to tourists, foreign or otherwise.Avan Marak Tsapatagh is on the east shore of Lake Sevan, at an altitude of two kilometres. The sun is strong but the air is cool, and as we drive around the lake’s perimeter, the natural beauty is overwhelming. “I’ve been to Lake Sevan a thousand times and it’s never same,” I’d been told by GoharAraratyan at Avan Villa Yerevan. “Sometimes angry, sometimes serious, sometimes romantic. The colour is always changing.” She was right, butyou don’t have to visit a thousand times to see all this; it can happen in a single day. The water changes from a dull grey through bright blue and deep indigo to an almost black, ï¬nishing up with that magical pink that only a sunset can provide. As we head round the shoreline, clouds cascade down the gorges in the mountains surrounding us like white ï¬‚uffy waterfalls; those resting on the surface of the lake are like the steam over a hot bath. Everything at Avan Marak Tsapatagh is rustic and natural. While European and North American travellers will be impressed with the quirky, minimalist and natural ï¬ttings, locals aren’t as enamoured of stone ï¬‚oors, cement walls and exposed beams. “When Armenians arrive here,they think it’s not ï¬nished yet,” conï¬des Hayk with a chuckle. There is an odd contrast between the seemingly basic surroundings and the modern inï¬‚uences: The bathroom has rough ï¬‚agstone on the ï¬‚oors and walls, but the piping hot shower has a trendy stainless-steel cuboid faucet. In the hotel’s restaurant, halogen lights (powered by energy from the solar panels on the roof, no doubt) illuminate the main dining area that includes a lavash bread oven and an indoor barbecue. An Armenian obsession, barbecue is the unofï¬cial national dish. There is even a street in Yerevan known simply as Barbecue Street, lined on either side by restaurants specializing in meats grilled over hot coals. At the very mention of the word “barbecue,” faces light up, and eyes sparkle at the thought of marinated chicken or lamb, crammed into ï¬‚at lavash bread with onions, fresh coriander and lots of yogurt.Avan Marak’s restaurant,Zanazan, is a short stroll away alongside the village, where guests can chat with locals, pick up an armful of fresh fruit or accept the hospitable offer of a bottle of mulberry vodka. This ï¬ery local brew, sold from roadside stalls in second-hand water or soda bottles,is 70- to 80-percent pure alcohol. “The Armenians have a saying,” Hayktells me. “If you are sick, it is medicine; if you are crazy, it is booze. marble and stone architecture; its location gives it a slightly wild retreat-like atmosphere.Back in Yerevan at the Club, a cool restaurant and cultural centre, the conversation turns to tourism. “Armenia is very exciting right now,” says Anahit Ordyan from the American University of Armenia. “Yes, we have lots of history – we are an open-air museum with a map full of monasteries and archeological structures – but we are also in the process of transition. It is amazing to see how Armenia has changed in recent years.”Hayk had told me of an Armenian saying: “You always have a place on my head.” (It loses a little something in translation.) As we sit sipping Armenian brandy in the tasting area of the Ararat brandy shop in Yerevan, he announces – for about the 20th time this week –“I would like to make a toast.” Here drinking is a popular pastime, but toasting is an art. Hayk’s toast is an impossible-to-recreate speech on his expectations – and even prejudices – about guiding an English woman for a week, about the joy of making new friends and the importance of building relationships across nations, about his pride at being able to show off his country and his pleasure at my enthusiasm and enjoyment. It’s a humbling moment and, I realize, indicative of my Armenian experience.When I was planning my trip, the very word “Armenia” provoked puzzled expressions from friends and colleagues – all successful, well-educated people – who weren’t ashamed to admit they knew nothing about this distinctly foreign-sounding place. But now, I felt I had discovered a brave new world, a place that is just about to appear on the radar of serious travellers. Roads, phones, loos and Tufenkian Heritage Hotels are only the beginning.As the toast comes to an end, just before we sample the best brandy I’ve ever tasted,Hayk says, “And, above all, you must remember…” Here he pauses dramatically, with an expectant grin, waiting for me to ï¬nish his sentence. I reply sincerely: “You always have a place on my head".